Now in its first complete English translation, this masterpiece chronicles life in a Soviet gulag, based on the author’s own years in a USSR prison camp. 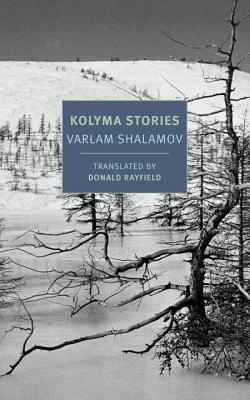 Kolyma Stories is a masterpiece of twentieth-century literature, an epic array of short fictional tales reflecting the fifteen years that Varlam Shalamov spent in the Soviet Gulag. This is the first of two volumes (the second to appear in 2019) that together will constitute the first complete English translation of Shalamov’s stories and the only one to be based on the authorized Russian text. Varlam Shalamov (1907–1982) was born in Vologda in western Russia to a Russian Orthodox priest and his wife. After being expelled from law school for his political beliefs, Shalamov worked as a journalist in Moscow. In 1929, he was arrested at an underground printshop and sentenced to three years’ hard labor in the Ural Mountains, where he met his first wife, Galina Gudz. The two returned to Moscow after Shalamov’s release in 1931; they were married in 1934 and had a daughter, Elena, in 1935. Shalamov resumed work as a journalist and writer, publishing his first short story, “The Three Deaths of Doctor Austino,” in 1936. The following year, he was arrested again for counterrevolutionary activities and shipped to the Far Northeast of the Kolyma basin. Over the next fifteen years, he was moved from labor camp to labor camp; imprisoned many times for anti-Soviet propaganda; forced to mine gold and coal; quarantined for typhus; and, finally, assigned to work as a paramedic. Upon his release in 1951, he made his way back to Moscow where he divorced his wife and began writing what would become the Kolyma Stories. He also wrote many volumes of poetry, including Ognivo (Flint, 1961) and Moskovskiye oblaka (Moscow Clouds, 1972). Severely weakened by his years in the camps, in 1979 Shalamov was committed to a decrepit nursing home north of Moscow. Following a heart attack in 1980, he dic- tated his final poems to the poet A. A. Morozov. In 1981, he was awarded the French PEN Club’s Liberty Prize; he died of pneumonia in 1982. Donald Rayfield is Emeritus Professor of Russian and Georgian at Queen Mary University of London. As well as books and articles on Russian literature (notably A Life of Anton Chekhov), he is the author of many articles on Georgian writers and of a history of Georgian literature. In 2012 he published Edge of Empires: A History of Georgia, which has recently come out in an expanded Russian edition, as have his Life of Chekhov and Stalin and His Hangmen. He was the chief editor of A Comprehensive Georgian-English Dictionary. He has translated several novels, including Hamid Ismailov’s Devils’ Dance from the Uzbek, and Nikolai Gogol’s Dead Souls (an NYRB Classic).